Central Garage Doors is known for providing quality commercial garage door repair and installation throughout San Jose, CA. We have acquired many loyal business clients over the years who wouldn’t dream of using another garage door repair company. Our industry knowledge coupled with a deep understanding of typical business practices enables us to provide our San Jose clients with the things that matter most to them. For every commercial job, we evaluate whether the client requires new garage door installation, an upgrade to a more attractive design, or specific maintenance. Our keen observations enable Central Garage Doors to provide the highest quality parts and materials for our customers. Each of our reliable technicians arrives to the job on time and with the tools they need to get right to work. 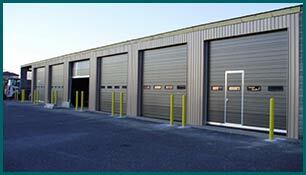 We offer our commercial clients garage doors created with the most durable materials available in the industry. Every door has the ability to withstand any demand that you can place on it. The garage doors installed by Central Garage Doors are designed for longevity and will not succumb to decay or breakdown quickly like the products offered by some of our competitors in San Jose, CA. Not only can our doors handle any type of pressure, they also offer safety to you, your employees, and your own customers. When only the best will do, contact Central Garage Doors to discuss your business garage door needs.